Reality School takes students through life goals, real income possibilities and bill payment to help them get an idea of life after school is completed. Some ended the day broke, while others paid their bills and had money to spare. 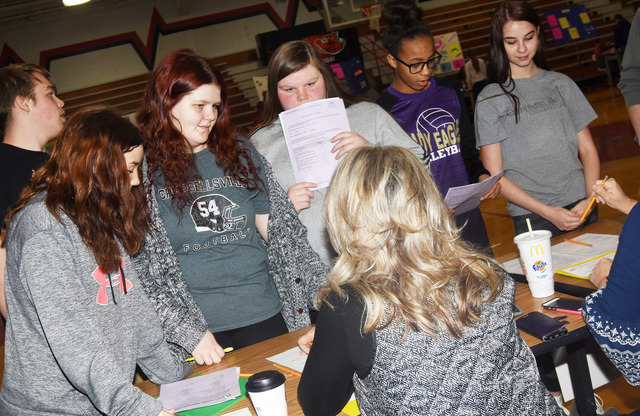 Campbellsville Middle School eighth-grade students recently got a dose of what being an adult is like during Reality Town. Reality Town allows students to see first-hand what it might cost to live after they graduate and are living on their own. Students choose a career and are told how much money a person working that career might receive each month. They are then told how many children they have and must support. Then, students use their monthly income to buy a home and vehicle, buy insurance and pay utility bills, buy food and clothing, pay for child care and medical visits, pay for entertainment, contribute to charities and their church and visit the "unexpected" booth. They are also asked to consider what type of lifestyle they want to live and whether they can save money after all the bills are paid. Representatives from various businesses in the community man booths at Reality Town to help students decide how to spend their money. 2018-04-11 - Taylor County, KY - Photo by Calen McKinney, Public Information Officer, Campbellsville Independent Schools. Campbellsville Middle School eighth-grade students recently got a dose of what being an adult is like during Reality Town. In the day of the exercises some wound up broke, while others paid their bills and had money to spare. From left are CMS eighth-graders Olivia Fields, Autumn Brown, Sumara Berry, AunDaya Coleman and Destiny Agee sign up for checking accounts.